2.1 This standard establishes multiple attribute sustainability requirements for gypsum board and panel products as defined in 5.18 - 5.20. 2.2 The criteria in this standard were developed based on the life cycle stages of gypsum boards and panels. Sustainability factors considered in this standard are: materials, energy, manufacturing and operations, health and environment, product performance, and product stewardship. Credit for innovations in these, or other factors not listed, is also addressed in this standard. 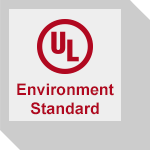 This revision of ANSI/UL 100 is being issued to reaffirm ANSI approval of the Standard.